Skirts are one of my main go to's in the Summer! It is soooo hot here in Florida, so a light flowy skirt helps me stay cool! Seriously the humidity in Florida is out of control! When I do my hair I avoid going outside as much as possible! Anyway, Skirts are easy to just throw on and be comfortable and cute! J.Crew's sale is ridiculous right now! I really have no self control when I go into J.Crew! I snagged this skirt and sweater and (and a lot of other things) on super sale and I am so glad I did! I would love to see how you all style skirts in the summer time! Scroll down to share your look and to get some great inspiration! 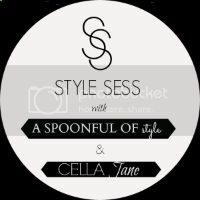 Welcome to the Style Sess Linkup! Rebecca from Cella Jane and I have teamed up to bring you a monthly blog linkup. Each month we will be teaming up and showing you our style on trending looks. We want and encourage you to share your style with us as well! It's a fun way for everyone to share their style and discover new blogs. This month's "Style Sess" theme is Summer Skirts. Want to join the style linkup? All you have to do is join by entering your post link showcasing your style! Also we ask for you to followA Spoonful of Style and Cella Jane via Bloglovin, Facebook or IG. Grab the button and spread the word on the fun linkup! Love that skirt and clutch! I think I need to take advantage of this sale and get myself a skirt! I can definitely relate to the humidity thing! Living in Texas, I always get my hair perfect inside and then going outside with the heat and humidity just ruins it! But, your hair is absolutely gorgeous and I love that outfit. Such a classy look, it's definitely something I would wear! Beautiful as always! Look the look, excited for Style Sess every month!! And your hair is gorgeous! Jealous! You're so gorgeous Jade! I love your new J Crew pieces and you're totally right about the humidity. Love this look! I stopped in at j.crew today and they had extra 40% sale items! Such a great deal! Love this outfit! I just found your through Cella Jane and I am so obsessed with your hair and your style! You have such a glam-chic vibe going. Love it! I LOVE the ginormous pearl necklace!! Amazing outfit! Love the necklace and shirt so much! !